To win races you have to sail fast. Performance Racing Trim shows you how. The North U Trim book treats boat speed and boat handling topics in the same accessible style as North U Tactics. 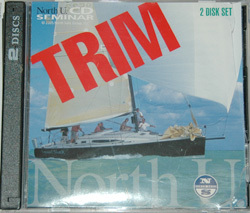 TRIM gives complete coverage to upwind and downwind sail trim and boat handling, including mainsail and genoa trim, helming and the trim, and handling of both conventional and asymmetric spinnakers. Learn how angle of attack, depth and twist effect performance. See how changes in pole position change spinnaker shape. Understand your options for spinnaker takedowns. Special sections on Trim Solutions solve the most baffling performance problems, while the boat handling skills and drills show you how to turn your crew into a team. Packed with illustrations, written to be read, the Trim book will teach you techniques you can use will use for a lifetime. We're going to start with North U. 's Trim manual, which rolls in at a solid 208 pages. Of course, it could probably be twice that size and still not touch on all of the available information about sail trim. But I do have to say, I was kind of blown away by the completeness of this book - it's broken into four parts, which I'm going to touch on and review individually. Okay, so this book is kind of like a freight train -- the first two chapters start off a little slow and basic. Initially, my fear was that this would be the trend for the entire book. Things do start to pick up from there though, hitting on everything from lift generated by the keel to sail depth and draft position in the third chapter. At worst, it's a worthy refresher course that most racers will blow through quickly. This is where you start to hit the real meat and taters of the book and the freight train really starts to pick up some speed. The first chapter of this part is actually a really smart addition to the book that could have been overlooked in favor of just getting into the nuts and bolts of upwind headsail and main trim. It goes over the elements of a good tack for everyone on the boat (driver, tactician, etc) and hits on related topics like proper execution of reefing, headsail changes and ducking. This is a chapter that is taken for granted as common knowledge, but a very nice review to help keep it in your mind. Over the next 34 pages, you get a complete and thoughtfully worded run-through of genoa trim and main trim. I say thoughtfully worded because these are sections that you could easily get crazy technical with, but the book keeps it clear and easily to follow. The following two chapters nicely compliment the preceding trim chapters by addressing the importance of upwind helmsmanship by the skipper (super important) and giving additional pointers for various conditions (light/moderate/heavy air) and situations (i.e. : you're pointing well but lack speed). I'm not going to lie, I was taking some notes in this section -- I've long believed that the spinnaker legs and downwind sailing is the great equalizer at most events. Boats that have their acts together make huge gains on the downwind legs; those boats that don't tend to get passed like they're standing still, waiting at a bus stop (only with more yelling...). This part starts out with downwind boat handling, going over everything from setting up a symmetrical kite to jibes, takedowns and peels -- this is a great chapter for "newer" crews. The next chapter does the same thing, but for the asymmetrical kite. From there, it gets into the actual trim of the spinnaker -- again, it's a comprehensive look at performance and various modes of trim that incorporates not just the trimmer, but the crew and driver as well. I can't think of a boat that I've sailed on in the past four years that wouldn't have benefited from reading these sections; and no, I'm not rocking out at the MedCup but I'm not sailing with total hacks either. The last chapter again gets into the driving of the boat downwind... that's right skippers, proper trim doesn't just fall onto the guys in front of you. The last chapters are good reminders to most of us that everyone seems to know but they rarely execute -- proper boat prep, rig tune and how to use your instruments correctly. The boat prep section is pretty short, so allow me to provide a brief synopsis: GET ALL OF THE USELESS CRAP OFF THE BOAT. Overall, I thought this book was very good. It is definitely an easier read that the other option out there (Stuart Walker's Manual of Sail Trim, which is fantastic but painful), with nice illustrations to really drive points home. There are sections that are basic, as this manual provides a ground up approach to sail trim. However, the way it pulls together all of the positions on the boat, especially the skipper, and lays out step by step instructions for success really make this a manual that everyone short of the pro level can learn from. And for $25.00, it doesn't get much better (and there are a bunch of "Cat 3's" who need to look at this too... you know who you are). As for the Trim CD (there's actually two of them), the layout is VERY similar to the book and is more a companion than anything else. Much of the same material is covered and it includes narration, animation, video and additional pictures to reinforce topics. If you're a more of a visual learner, this is a great option and you could certainly get it by itself. Only complaint -- it is a little dated and probably in need of sprucing up. However, all of the information is still relevant, so don't let the older pictures and images scare you away.